We’re a family of pizza lovers! Pizza, kale, quinoa and steel-cut oats are ranked pretty high in our house. Friday nights are pizza night in our house! We get our aprons on, open a bottle of wine (the wine is just for me) and roll out the dough. It’s a very therapeutic thing to do after a long week, and fun way to work together and catch up on life. I love this pizza because it’s meatless, simple to make, and pretty healthy to boot! It’s your basic run of the mill cheese pizza, except that you are replacing the traditional tomato sauce with a roasted red pepper puree, and then topping it all on a thin and crispy whole-wheat pizza crust. Genius and yummy! Red peppers are ultra good for you, and this pizza is an easy and delicious way to get them into your diet. My kids loved this pizza, seriously, I’m not lying. They thought the red pepper sauce tasted as good as any tomato sauce, and they didn’t complain about it being on a whole-wheat crust. I honestly don’t think they even noticed that it was on a whole-wheat crust until I mentioned it, so maybe you don’t have to mention it to your kids if you think they might turn up their noses. Sometimes you have to be sneaky as a parent! Note: The roasted red pepper sauce can be made ahead of time and refrigerated till needed. 1 pound whole-wheat pizza dough – you can use regular pizza dough here as well if you don’t like whole-wheat crusts. I typically use Trader Joe’s or Whole Food’s whole wheat crust. 1 pound fresh mozzarella, thinly sliced – you can also buy the shredded mozzarella and make it easy on yourself. Wash the red peppers and then cut them in half lengthwise. Cut off the stem with a paring knife and scoop out all the seeds and membranes. I used a melon baller to scoop out the seeds and membranes. Place the peppers cut side down on a baking sheet that has been lined with foil. Roast the peppers in the pre-heated 450 degree oven for about 25 minutes; until the skins are completely wrinkled and the peppers are charred, rotating the sheet if necessary for them to cook evenly. Below is what mine looked like after roasting for 25 minutes. Let the peppers cool for a minute or two, and then remove them from the baking sheet and place them in a bowl, cover the bowl with foil or a plate, and let cool for about 30 minutes. When the peppers are cool enough to handle, peel off the skins and discard them, dropping the peppers back into the bowl. 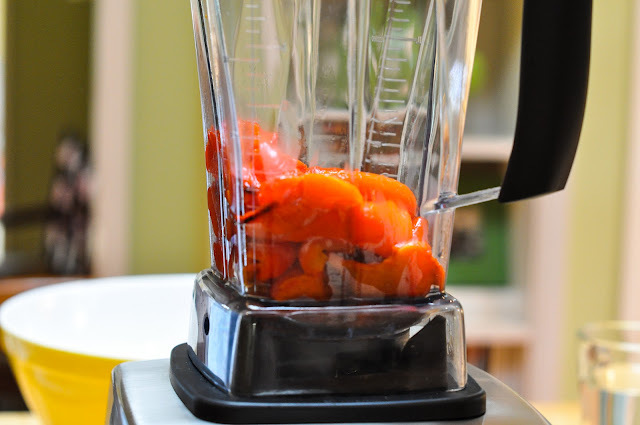 Put the peeled peppers into a blender. In a blender, puree peppers until smooth. Season to taste with a pinch of salt and pepper. Pour the sauce into a bowl if you’re not using it right away, and refrigerate until needed. If you’re using the puree right away, then just keep it in the blender for easy pouring. Now, lets move onto the pizza. Preheat oven to 500 degrees. Slice up your cheese, toss some arugula with a splash of olive oil and set aside. 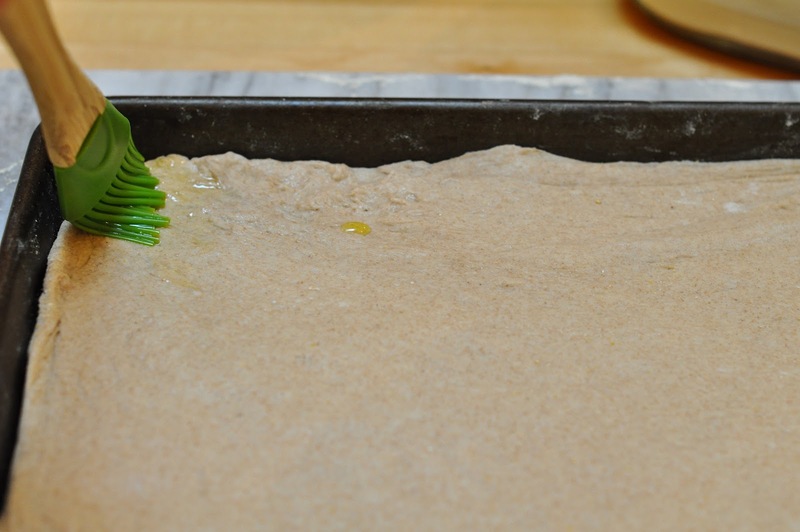 On a floured work surface, roll the dough into a rectangle shape. You can also roll the dough out into 2 circles, one large circle or 4 small circles. It’s really up to you. We chose to make one large rectangular pizza. Easy peasy! 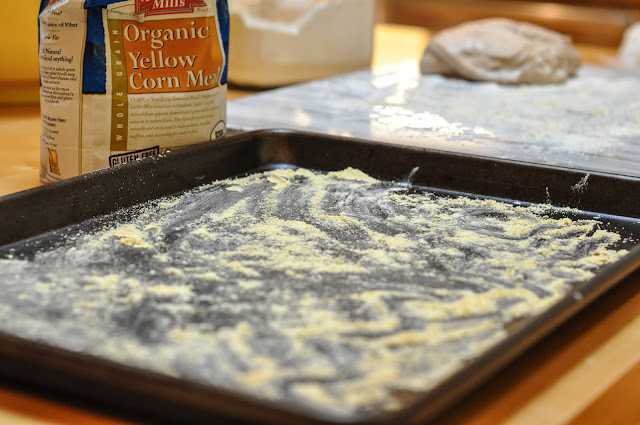 Sprinkle a rimmed baking sheet with cornmeal and shape to fit the pizza dough onto the pan.The corn meal helps to keep the pizza dough from sticking to the pan and also helps to make the pizza crust a bit more crunchy and taste like its from an actual pizzeria. Brush the edges of the dough with some olive oil. This helps to crisp up the crust. Top the dough with the red pepper puree (as you would a tomato sauce) making sure to leave a 1-inch border on the sides. Top the pizza with the mozzarella cheese and drizzle with a bit of olive oil. Bake until crust is golden brown and cheese is melted and bubbling, about 10 minutes. Top the pizza with the arugula. Slice it up and serve with your favorite salad or vegetable. We love pairing this pizza with my lacinato kale salad. 1 pound whole-wheat pizza dough - you can use regular pizza dough here as well if you don't like whole-wheat crusts. I typically use Trader Joe's or Whole Food's whole wheat crust. 1 pound fresh mozzarella, thinly sliced - you can also buy the shredded mozzarella and make it easy on yourself. 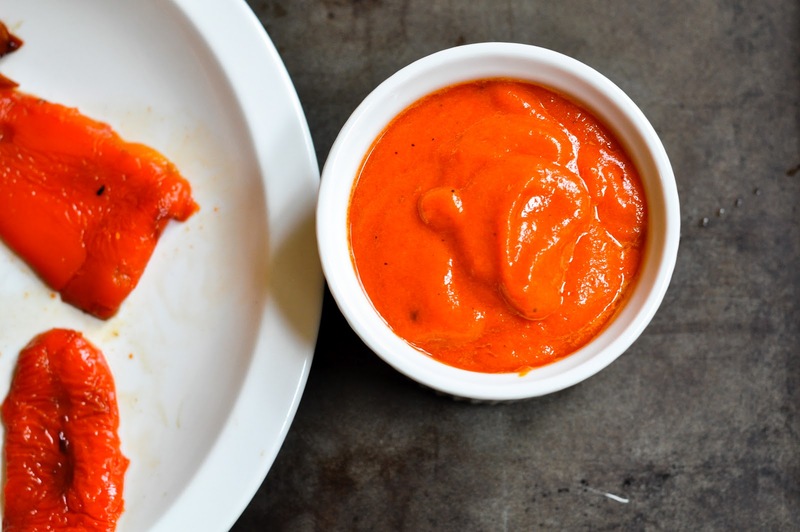 In a blender, puree peppers until smooth. Season to taste with a pinch of salt and pepper. Pour the sauce into a bowl if you're not using it right away, and refrigerate until needed. If you're using the puree right away, then just keep it in the blender for easy pouring. Now, lets move onto the pizza. Preheat oven to 500 degrees. 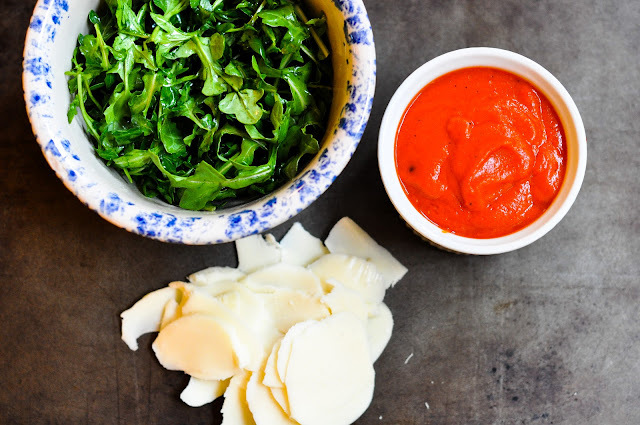 Slice up your cheese, toss some arugula with a splash of olive oil and set aside. 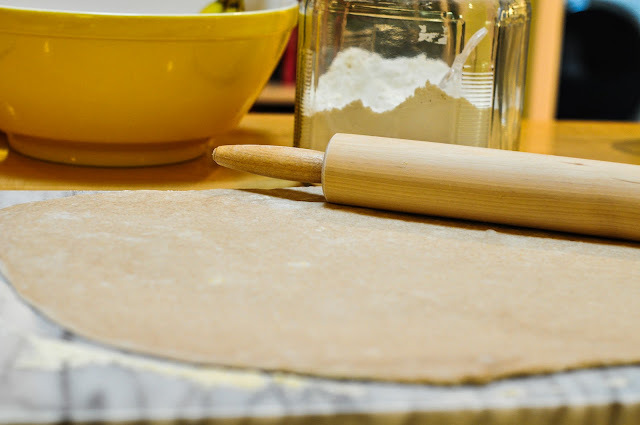 On a floured work surface, roll the dough into a rectangle shape. You can also roll the dough out into 2 circles, one large circle or 4 small circles. It's really up to you. Sprinkle a rimmed baking sheet with cornmeal and shape to fit the pizza dough onto the pan.The corn meal helps to keep the pizza dough from sticking to the pan and also helps to make the pizza crust a bit more crunchy and taste like its from an actual pizzeria.Brush the edges of the dough with some olive oil. This helps to crisp up the crust. Top the dough with the red pepper puree (as you would a tomato sauce) making sure to leave a 1-inch border on the sides. Top the pizza with the mozzarella cheese and drizzle with a bit of olive oil. Bake until crust is golden brown and cheese is melted and bubbling, about 10 minutes. Top the pizza with the arugula. Slice it up and serve with your favorite salad or vegetable. I just posted about 1 hour whole wheat pizza crusts and this pizza of yours looks incredible! So vibrant and fabulous! Hi there! I know this is an old post, but I want to thank you for the easy and fantastic tips of rolling the crust out to the size of the pan…I borrowed your tips and made “his and hers” pizza last night and loved it!! I gave you a shout-out on my blog! Thank you!! Oh these looks so delicious – isn’t it great when the kids get on board and learn to love arugula!!! Thanks so much Tricia! I love pizza as well. It’s the perfect comfort food. Thanks Zoe and welcome back! I can’t wait to see what recipe you post from Barefoot this month! I’m still working on one. Okay, this dinner is all I need to eat again. Ever. Especially with that dessert. I just love pizza and this one looks amazing. Hi Marina. I actually thought of you as I posted this recipe as I knew it would be right up your alley. 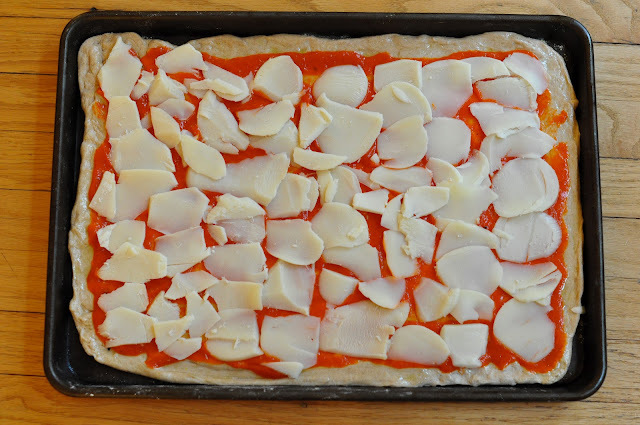 This might turn out to be one of my favorite pizzas, especially when red pepper season rolls around in the fall. I love roasted peppers. I love arugula. I love whole wheat crust. I might make it with tomato and just put the red peppers under a layer of cheese though (so they don’t burn). Usually, I don’t use recipes for pizza, other than for the crust: I just toss in whatever I have: mushrooms, olive, eggplant, sausage, Canadian bacon, feta — not all on the same pizza! Hi Sharyn. I love that you are excited to try this recipe and I can’t wait to hear what you think when you do try it. I love experimenting with pizza as well and throwing on whatever we have lying around in the fridge. My next feat is to make my own homemade pizza dough. Moosewood has a great whole-wheat no-knead dough recipe that I am going to try soon. Now that is my kind of pizza! The dessert looks tasty too. This looks wonderful – I can only imagine how great it tastes! OMG – your photos are AMAZING!! Love love love! What lens are you using?? ps – isnt asparagus soooooo good at the moment!!??? I just purchased a new lens and it cost me a pretty penny but It’s been worth it. I am still getting use to how to focus it better. There is no zoom on the lens so when you get to close to something, it can blur that object. It’s a nikon AF-S Nikkor 50mm1.4 G. It’s a great lens for portraits and for low light situations, like winter. I am actually loving the photos I am getting of the kids. The kids are crisp and the backgrounds are blurred. I got some great ones of Zoe from lax this weekend. Finally! Were eating tons of asparagus before it goes out of season! It’s local and organic now! Thanks Quay! I hope you enjoy it and let me know how it turns out for you! This pizza looks so rustic and has both my favorite ingredient. I know I am going to love it.